What a pretty set! I'd love to try that wool, it looks so soft! How absolutely beautiful. Love your podcasts. thank you. I'm bigblueice on Ravelry! How lovely! That green is spectacular! Also, thanks for the free baby pattern - definitely going in my queue. Super adorable! What a cute pattern - and the yarn is gorgeous, too! Such a cute set in my favorite green with wooden buttons. Yay the podcast is back! Thanks as always for the chance to win. I'm ShadowAP on Rav. As a knitter who is expecting, it's all about the tiny knits right now. And that one is so cute. What a beautiful set. Love! What a fun kit! I love the soft green yarn. Hi! My ravelry id is meemsy94. Thanks for this great giveaway!! Good to hear the podcast again! Would love to win this kit. Too cute! Oooh, the yarn. That is a beautiful green. The pattern is already in my queue. What a nice kit. A friend is having a baby soon too. Thanks for offering such a great giveaway! I saw this yarn in my local knitting shop and it is soooo soft!!! And I love the buttons and labels shown in the patterns. The cardigan would be absolutely perfect for my little grandson, Mason who's one and a half. On Ravelry, I'm knittrip. Ah, that yarn is lovely. Gorgeous yarn - would love to try some on baby clothes! Oh such pretty yarn I'd love to win. I love the color of that yarn!!!! We have a new baby coming to our family in Dec. or Jan. this is just what I need to made something for this little one. I'm glongley on Ravelry Thank you. Such a cute kit! I'm pinkfawn on Ravelry. I can't get enough baby knits right now! Fabulous color!! I'm treasuregoddess on ravelry or my email is christine at treasuregoddess dot com. YAY! YARN! Id love to knit this. Beautiful colour for a lovely set! Would love to knit this! Thanks for the opportunity. How lovely! I have 2 new babies to knit gifts for so fingers crossed! It was great to meet you in Cordova, however briefly :-). This yarn is yummy. Yay for a new episode! And that is very pretty yarn. What a beautiful prize! I love knitting for babies and all of the extras are wonderful. Nice giveaway! Can't wait to listen to the podcast! The bottons look beautiful with that great pattern... and yarn! I'm anyonecanknit on Ravelry. What a sweet kit! I'd love to win. Adorable! And I love the colour of that yarn! Thanks for another great giveaway. What a beautiful color green for a baby sweater! 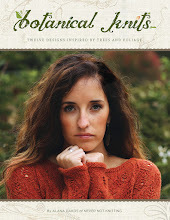 I'd love to win this prize with all you need to make this sweater. Thank you for the chance to win! One of my favorite colors - green. Very pretty. Great color for a baby sweater. Soooo glad you're back! Thank you so much for a great podcast and for sharing your summer knitting adventures. 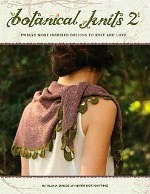 Great give away...would make an awesome sweater for my brand new granddaughter! 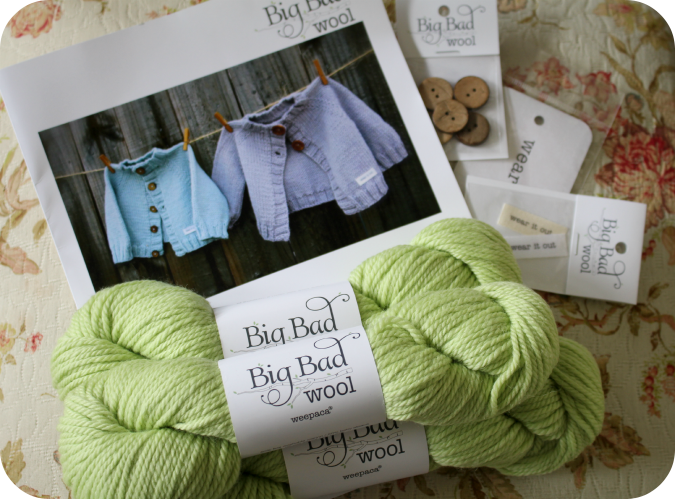 Love your podcast and love that Big Bad Yarn! It's good to hear your voice again! I've been wanting to make a little cardi and this one is adorable. Thanks for the chance to win! Lots of new babies around me so this could come in handy! Love your Podcasts! The green yarn looks so squishy & soft. The baby sweater would be a perfect gift for my boss who is due in January. Oh, this yarn looks lovely. The color is amazing, too! What a really neat kit. Thanks for the giveaway. Love the apple green yarn, and of course I always love babies. A new podcast and a giveaway! Such a pretty color green! How cute! Would love to try out this yarn. Enjoyed the podcast a lot! I love that color of yarn too! Thanks for a chance to win! I loved the two babies story. Charity knitting is so rewarding! :) I'm so glad for listen your. I love do things for a babies too. What a great kit and better give away! Thanks! I can already see my beautiful granddaughter Cora wearing this! I'd love to win ... and what a great episode. It's nice to hear you again! I'm ayntbee on Ravelry. What a beautiful kit! I'd love to knit this for my new little niece! love the color...love the pattern! and I have a growing list of baby knits to do!!! We were in Alaska for 2 weeks in June but did not cruise so did not get to Cordova. Alaska is a beautiful place. This kit is darling and I would love to win it. After listening to this episode, I felt like binge watching Northern Exposure and knitting baby hats. I have made nearly 200 preemie hats. I just love charity knitting. And that sweater would be great for my new grand nephew. Great episode, it's good to have you back. I loved hearing about your trip, it sounded idyllic. That is a very lovely package. Thank you for all the wonderful posts, patterns, and this opportunity ! What a neat kit! Love it! Oooh just in time for my new baby niece! Sooo pretty. Love the color would be so happy to win! Welcome back. Those are really cute. Nice to see you back, just in time to gear up for Fall weather knitting! That looks like a great kit! Such a gorgeous baby cardi and the yarn looks lovely. Nice to have you back podcasting, REALLY enjoy it! Thanks! Wow, what a prize! Would be a fun project! Thanks for the chance! Having just worked my way through your back catalog I was so excited to listen to my first episode in "real" time. This little sweater would be lovely for a new niece or nephew we're waiting to meet! The yarn looks lovely; it would be fun to give it a try. Love the podcast! Very sweet knit for a baby. I would love to try it. Thank for this gift opportunity. That's a beautiful green! I loved hearing about your trip to Alaska, it sounds like a great place. I have lots of babies to knit for in the next few months...I'd love to win this kit. perfect for little babies and there are a few for me to knit for. I am so happy you are back. As usual I love your show and your books want me to drop everything and start knitting. I've just listened to your podcast for the first time. Very enjoyable! This yarn and pattern look perfect for a sweet baby. Such a pretty green! Would love to knit up a baby sweater! Love the yarn and the color...pick me, pick me!!! That is soooo my sort of color! Love your podcast! Would love to be this episodes winner. Love your podcast, Alana! This yarn is quite lovely!! I have the perfect recipient for this project! Beautiful! cute!! it will make a beautiful gift. absolutely love it. Thanks for coming back from your break. I'm so jealous - your trip to Alaska sounds wonderful. 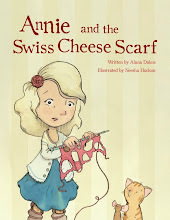 I enjoyed Robyn Devine's story (and then poked around her blog - and I noticed, btw, that her son also refuses to wear hand-knits....). Ooh, that is sweet as it can be. I can see my grandson in an apple green cardi this winter. Such a cute kit a must knit for sure. Welcome Back!!!!!! I love the cute sweater! I just found out my nephew is expecting a boy! This would be perfect! I'd love to knit this for a special little someone. Just found out I am going to be a grandma so I could really use that kit. Perfect for my new granddaughter! Hey, great blog, awesome competition. Really nice kit! I´m Lammas on Ravelry. So beautiful wool. I hope I'll win it! So sweet! Very nice of you, thanks! Beautiful kit! And I'm glad you're back to podcasting Alana! what a beautiful package. My close friend is due in Nov. and her child needs a cardi. Knitgen on Ravelry. I am cateydowney on ravelry and catey.downey@gmail.com. First time listener. Great podcast! Loved the story in this episode. loved the story and your theme song is great, makes me laugh. What a cute kit, and what lovely yarn! I'm always on the lookout for baby yarn that is as special as the babies I'm knitting for as well as easy care for the mother's sake. This looks perfect! It's so great to have these podcasts to enjoy and look forward to again! Lovely to hear about Robyn's blog, I'll be checking that out now. Please enter me in the contest! Cute cute cute! My niece is about to have her first baby. I have to knit but there's too many choices. This would make it easy, Pattern + yarn + cute all ticked off in one go. The pattern is adorable and the yarn looks so squishy. Love the gender neutral green too. Thanks for the chance to win this wonderful set. The yarn looks soft and the color perfect. Loved hearing about your Alaska adventure ! The wee fox is adorable, I'm casting it on for my grandson's first birthday! I enjoy your podcast so much! Wow, what a great set! Love the color, I've been a little or a lot obsessed with pale greens this year! This is gorgeous. Thanks for the chance to win. That jacket would look ADORABLE on my cat! I may need to make the adorable fox as a big boy present when baby #2 arrives in Oct. So the baby set would certainly come in handy for my family. Thanks for the offer. My daughter is expecting her first child in a few months, and I would love to knit her baby a sweater out of that yarn! BJLaValle on Ravelry. Yay! Excited you are back! The fox is soooo cute. That wool looks absolutely lovely. I would love a chance to win it! 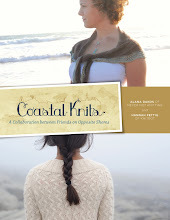 Great blog you have, such beautiful knits you make! Oh how adorable! I can't wait to try it! The color of the yarn is lovely. I would love to give it a try. Thanks. What a lovely yarn. And someone close to me is soon having a baby. What yummy looking yarn! Green is my favorite color. It was so nice meeting you in Cordova. I agree with you, there is so much that is so right and perfect about that town! The perfect green for a little one! How cute! There's a new baby on the way in my family, this would be perfect to make a welcome home gift for the little one! My Ravelry name is LisaM87. So nice to hear your podcast again after the break! I'd love to knit this pattern and yarn! I love the simple clean look of this yarn and the patterns. OOOOh pretty! I would love to knit such a nice pattern! Such a lovely yarn. Crossing my fingers! Thanks. I started at the beginning a while ago, and I'm finally up to speed and able to comment and enter for prizes.. :) Thank you for a lovely podcast! I just found out that my fourth grandchild is due in April 2015. I would love to make this for him or her!